Bill Murray playing Franklin Delano Roosevelt. Dogs and cats living together. Mass hysteria! In what could potentially be a dynamite (and dare we say, potentially Oscar-worthy?) 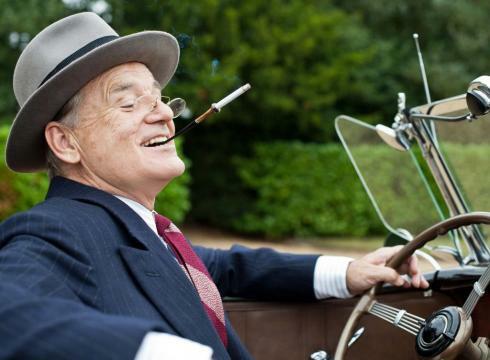 bit of stunt casting, Bill Murray is set to play FDR in the upcoming film "Hyde Park on the Hudson" for director Roger Mitchell ("Notting Hill," "Morning Glory"). And USA Today has posted the first look at Peter Venkman as our nation's 32nd President. The film takes place in 1939, and is based on a summer weekend when FDR hosted the King and Queen of England on the first-ever visit to the colonies by a reigning English monarch. With the threat of war with Germany looming, Roosevelt and his wife Eleanor (played by Murray's "Rushmore" co-star Olivia Williams, in a serious historical beauty makeover) deal with diplomacy while Franklin also contends with the deepening relationship between himself and his distant cousin, Daisy (Laura Linney). You've got a solid cast, a standout bit of central casting, and a story that not only mixes historical drama with taboo love triangles, its main figure is wheelchair-bound with polio. If at some point the King and Queen break into a dance number, this could be the most Oscar-baiting movie of all time. "Hyde Park on the Hudson" is due out next year. Should Murray even be nominated for this, how much further down his "To Read" pile do you think "Ghostbusters 3" is going to go? Dan Aykroyd is going to need a spelunking crew to get that one back.